We’d love your help. Let us know what’s wrong with this preview of Brush of Wings by Karen Kingsbury. Despite needing a heart transplant and against the advice of her doctor, Mary Catherine moves to Uganda to work at a brand new orphanage. Whatever time she has left, M From #1 New York Times bestselling author Karen Kingsbury comes the third novel in the unforgettable Angels Walking series about divine intervention and the trials and triumphs of life for a group of friends. To ask other readers questions about Brush of Wings, please sign up. how to open this book....is i am to pay for this book or its free? As with the other novels, Kingsbury highlights the role of angels in the lives of the novel's characters. This story centers on Mary Catherine. She is in need of a heart transplant and it looks like the chances of that happening are slim. Convinced the relationship between her and Marcus should not continue, she spurns his love for her and goes to Africa. The angels take on the tas This novel is the third in the Angels Walking series and to really enjoy it fully, one should read the previous two. Brush of Wings is the third and final book in Karen Kingsbury's Angels Walking series and all I can say is Wow! This series touched my life in more ways than one and the third book wrapped it up in a heartfelt moment where a wonderful fulfilling sigh escaped my lips. The story of Mary Catherine and Marcus, along with Tyler and Sami, will leave you feeling whole again. At least that's what it did for me. Karen, you've done it again! Thank you. 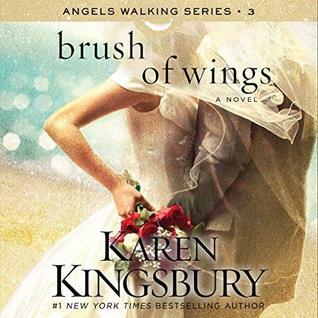 Brush of Wings by Karen Kingsbury is the third book in the Angels Walking series. It can be read as a stand alone although you may not understand a few things throughout the book. I have thoroughly enjoyed this series and was sad to see it end. As with most of Karen's books I fell in love with the characters and found myself laughing and crying right along with them. In this book Mary Catherine faces a serious health crisis. She refuses to tell anyone just how serious it is and instead focuses on Brush of Wings by Karen Kingsbury is the third book in the Angels Walking series. It can be read as a stand alone although you may not understand a few things throughout the book. I have thoroughly enjoyed this series and was sad to see it end. As with most of Karen's books I fell in love with the characters and found myself laughing and crying right along with them. In this book Mary Catherine faces a serious health crisis. She refuses to tell anyone just how serious it is and instead focuses on her desire to go to Africa. She's determined that IF she is to die she will do it on her own terms loving the orphans and spreading the message of God. What can be more noble than that? She goes against doctors orders and leaves family and friends in the dark promising herself if she gets really really sick she will tell Sami, her roommate. I don't believe Mary Catherine was cold hearted or malicious by not telling them. She didn't want to be a burden on those she loved. She also didn't want Marcus to waste his time and heart on her when she wasn't sure she was going to live. She loved them, Marcus and her friends, and didn't want to burden them with worries of her health or to have them talk her out of this trip to Africa. She longed to help at the orphanage and felt like God was calling her to do that. I admired Mary Catherine's spirit. She loved life but most of all she loved God. She never once stopped praying to God for guidance throughout her entire story. Whether she was having a good day or a really bad one she never forgot her Lord. I felt bad for Marcus. Here he is madly in love with Mary Catherine and he doesn't understand why she's pushing him away. He knows their feelings are real, yet she won't fully commit to him. Even when he says he loves her and will wait for her even as she goes to Africa, she says she just wants to be friends. It takes a strong man of faith to love Mary Catherine and Marcus Dillinger is just that man. Although he's still new to his faith he loves God with all his heart and he relies on God to guide his footsteps. I have to admit Marcus made my heart swoon. Who wouldn't want a man who loves God desperately first and pursues you with that same determination?. He wasn't overly pushy with her but he was definitely forthright. I also loved how he asked God for a sign and God answered. I can't tell you how many times I've begged God for a burning bush or something to tell me what I should do. Friends, I absolutely loved this book. It's definitely a love story but not just one between man and woman. No, it's a love story between God and his people. You feel that throughout this book. It's like God told Karen "write a love story to my people". *sigh. I can go on and on but I'd rather you get a copy and read it for yourself! The book isn't available to March 29th but you can pre-order it for the next few weeks. If you pre-order you can receive a gift from Karen. All the details are on Karen's webpage and Facebook page. You can pre-order as many copies as you like. You may be thinking "what will I do with more than one copy of the same book?". Well, be an angel to somebody;give a copy to your neighbor, a single mom, or leave one at the doctor's office. They will be blessed and you will too. This was the final book in the Angels Walking series. As expected from Karen Kingsbury, this was a great conclusion to the series, however I did feel it drag a bit in the middle. I got very frustrated with Mary Catherine in this book. In book 1 and 2 I felt she was a strong character, but in this book I felt she was acting selfish and almost like a spoiled child who makes decisions based on their will. What was great for me in this book though was the message I got from it. That some times we act This was the final book in the Angels Walking series. What was great for me in this book though was the message I got from it. That some times we act as spoiled children, acting in our will instead of God's will, trying to convince ourselves that it is God's will. Even though we are stubborn and walk a bit of God's path for our lives, He still works everything to our will, protecting us and guiding us gently back to His path. Sometimes we make decisions because we limit what God can do in our lives, like Mary Catherine did with her illness. Not the best book in the series, but still amazing. I loved this conclusion to the Angels Walking series. The stories were heart-wrenching, full of inspiration, tough choices, and love. I was happy with the ending, but sad to say goodbye to these characters! I received an arc from Netgalley in return for my honest review. This is the third and final book in the Angels Walking series. I honestly give this a 3.5. I am a huge Karen Kingsbury fan, and enjoy many of her novels. This one was enjoyable- just not my favorite. My favorite part of the Angels Walking series, and this one for certain, is the guardian angels set on missions to protect us and help God's plan come to fruition. It gives me chills to think how angels have worked in my life. This book I received an arc from Netgalley in return for my honest review. This is the third and final book in the Angels Walking series. I honestly give this a 3.5. I am a huge Karen Kingsbury fan, and enjoy many of her novels. This one was enjoyable- just not my favorite. My favorite part of the Angels Walking series, and this one for certain, is the guardian angels set on missions to protect us and help God's plan come to fruition. It gives me chills to think how angels have worked in my life. This book mostly focuses on Mary Catherine and her health crisis. I like how Lexy is also brought into this book, as I have to say she is one of my favorite characters, and she is brought into this book in a major way. Of course Sami and Tyler are back, as well as Marcus. Marcus's strong personality and belief in God really shows in this book. The book as a sweet ending, which of course is enjoyable. A beautiful conclusion! Every moment pulled me into each situation and made my heart race for Mary Cathrine and marcus or skip for Sammy and tyler. I couldnt have asked for a better finale. This was the perfect ending to the series. I loved it! From the beginning the reader knew that there was something special coming, but I didn’t figure it out until near the end of this third book. It was so beautiful. I am grateful for the angels that God has said surround us here on earth. I love to think that beings as wonderful as the ones in these books are looking out for me. - interesting main character(s) with depth and intrigue. - UNTIL... they get together. And then they get married immediately. And then there's a baby. Immediately. In twenty pages you're in cliche cheeseville, and I'm a vegan y'all. I don't do cheesy. It's just so artificial, and it happens the same way (nearly) every time. Karen Kingsbury writes *so many books*, and it reads like she's in a rush to finish them. The ending is always so rushed and over the top. Sometimes I need a reminder of God's goodness and power, and Karen Kingsbury books always deliver a great message. The idea of being protected by angels is comforting and I have given thanks to my guardian angel a time or two. Mary Catherine's heart is weakening quickly, and she doesn't want to burden others with her pain, not even those closest to her. She pushes Marcus, the man she loves, away determined to go on a missionary trip to Africa. In telling no one of her condition, it seemed Mary Ca Sometimes I need a reminder of God's goodness and power, and Karen Kingsbury books always deliver a great message. The idea of being protected by angels is comforting and I have given thanks to my guardian angel a time or two. Mary Catherine's heart is weakening quickly, and she doesn't want to burden others with her pain, not even those closest to her. She pushes Marcus, the man she loves, away determined to go on a missionary trip to Africa. In telling no one of her condition, it seemed Mary Catherine was denying the seriousness of her heart failure. Can the angels work to save Mary Catherine's life? Can she and Marcus find hope in their future? While I enjoyed the book, I found everything to be a bit "perfect" and predictable. A easy read for a faith "pick-me-up". This is the third and final book in this series. And probably my least favorite although I am not sure I can put into words why. This is the story of Mary Catherine and Marcus, who we have met previously. We also see the angels return and Sami, Tyler and Lexy - all our old friends are back to close out the series. Light, enjoyable read. Best of the three part series. I don't know if I have acclimated to the writing style or I was just really determined to enjoy Mary Catherine "I need a heart transplant, but not as much as I need to fulfill my lifelong dream of volunteering at an orphanage in Uganda" Clark and everything about her story, but I was able to brush off most of what annoyed me and enjoy what I came for. I do think the romance between her and Marcus is generally lovely, when they are not being over the top about religion, and I still adore her as a I don't know if I have acclimated to the writing style or I was just really determined to enjoy Mary Catherine "I need a heart transplant, but not as much as I need to fulfill my lifelong dream of volunteering at an orphanage in Uganda" Clark and everything about her story, but I was able to brush off most of what annoyed me and enjoy what I came for. I do think the romance between her and Marcus is generally lovely, when they are not being over the top about religion, and I still adore her as a character on her own. Sami and their friendship, too. I see a lot of reviews complaining about MC's selfishness, but I felt nothing but empathy for her brave determination to see through her health issues on her own and not burden anyone else with the knowledge of her potentially imminent demise, even if she did a poor job of putting off Marcus. This review has been hidden because it contains spoilers. To view it, click here. Amazing conclusion to the series. I understand why Mary Catherine didn't want to tell anyone about her condition, but it still felt just a little out of character for her, especially when she kept deteriorating in Africa. At the very least she wouldn't have signed on for another two months. But either way, I enjoyed the books, the character arcs, the angels' presence, and the way that events can tie together to make something amazing happen. I found myself through this series so in love we these characters. At one point in the second book when one of the characters is going to the doctor. I felt this desire to pray for her that is how invested I got in reading this book. As a graduate of Liberty University...I was quite proud to purchase and support Karen Kingsbury. She was now a professor at the university. The story was enjoyable. Series of novels when you first begin them are incredible, but at some point they all come to an end much too soon. This is the feeling that I had when I picked up Brush of Wings by Karen Kingsbury, the third and final novel in the Angels Walking Series, I have loved from its inception. I hate it when things come to an end like this one did. Even though it ended as I had hoped, it is still bittersweet when you understand that there will be no more coming. Nothing to look forward to. It's like sa Series of novels when you first begin them are incredible, but at some point they all come to an end much too soon. This is the feeling that I had when I picked up Brush of Wings by Karen Kingsbury, the third and final novel in the Angels Walking Series, I have loved from its inception. I hate it when things come to an end like this one did. Even though it ended as I had hoped, it is still bittersweet when you understand that there will be no more coming. Nothing to look forward to. It's like saying goodbye when you just were looking forward to so much more. For those of you looking for a great and compelling spiritual warfare series, you might just want to give this one a shot. It doesn't really focus on the spiritual aspect as much as other novels I have read, but that is the point. You don't want to lose focus on the reason for angels being called to their mission. You don't want the focus to be all on them and not on the humans God has called them to assist. If this group of four angelic beings doing not succeed at saving the life of Mary Catherine, then they have failed multiple generations in the process. Mary Catherine is struggling to come to terms with the meaning of life. She has been diagnosed with congestive heart failure and her doctor desperately wants her to consider being placed on a donor list. But Mary Catherine argues that even if she waits for six months, she isn't guaranteed a heart. She could die in the waiting, and that just isn't living for her. She manages to convince him to allow her to go to Africa to begin work on an orphanage there for six months and if things get worse, she will return home immediately. As much as he would like to convince her to stay, he relents. Mary Catherine doesn't want anyone to know because she knows if she tells them the truth, they will not understand and will keep her home. While she doesn't necessarily lie, she isn't forth coming when her parents, her roommate Sami or the man who loves her Marcus, tries to figure out the sudden urge to go to Africa right now. So Mary Catherine pushes them away and plans her trip anyway. It's not until she has been in Africa, that things begin to go horribly wrong, and soon she realizes that all her best intentions may have been in vain when she grows deadly ill. There are four main characters in this novel Mary Catherine, Marcus Dillinger, Tyler Ames and Sami Dawson. This Four characters are important because the need to stay together to raise a child with a great purpose. This four friends go through a hard journey, but at the end they are still standing, with the help of our supporting characters Ember, Beck, Jag and Aspin the four angels that have the mission to keep them together so this baby gets to them. We also have a very important person called Lexy who got pregnant with Dallas Garner the baby with a purpose. Brush of Wings is a christian novel published on march 2016. This novel talks about the story of four great friends and a baby with the purpose of turning the hearts of the people of the US back to God.. The story starts in heaven with Orlon talking to the angels that are going to earth to make sure Dallas will grow and be in a family where his purpose is fulfilled and to maintain the relationship between the four friends, Sami, Mary, Tyler and Marcus. Then it is situated in present California where the four friends live and it also gets some tima place in Uganda where Mary Catherine is going to live for some time. the main Character of this book is Mary Catherine, and she decides to go to Uganda to volunteer because she is dying and wants to forget about Marcus Dillinger, the love of her life. That takes a turn when Marcus goes on a rescue mission to save her and meets up with Lexy. Lexy is now pregnant of a baby with a great purpose but she doesn't want to be a mom at this moment so she has the baby and gives it to Mary Catherine and Marcus Dillinger to adopt. Finally, what i think about “Brush of Wings” is that it is a very interesting book that can appeal to any person. I liked this book because it can appeal to any person because we all go to problems, and knowing that sometime other people go through harder things than we do, but we often don't see it because we are thinking of our own problems. I don't like that the beginning of the book is really slow, but as it keeps going it gets better,The book good point comes when Marcus Dillinger learns that Mary is in Uganda and he goes on a rescue mission, when they get married and when they get to adopt their child. I learn to put myself on other people's shoes and don't think only about myself. I will totally recommend this book to anyone. Brush of Wings by Karen Kingsbury is the third book of the Angels Walking trilogy by Karen Kingsbury. I loved the way the story wrapped up and I didn't want it to end. I read the book in a little over a day because I couldn't put it down. I love how I was truly able to know the characters on a deeper level. I felt empathy for the characters at their pain and I felt their happiness. All of the characters to me felt realistic and like I could imagine them to be real people. I also did enjoy the angels in this book and how they each played a role in the main characters lives. In Brush of Wings we were in two different locations and I think they had a great impact on the overall story. I also think Karen did a wonderful job of a little summary of the first two books by weaving them into the story. I cannot wait to read more from Karen Kingsbury. Her books have changed my life for the better. Each time I read one of her books I learn more and about God. I also learn more about myself. Thank you Karen Kingsbury and her team for sending me an early copy of the book it means a lot to me. Also thank Netgalley for sending me an eArc in exchange for an honest review. I received this book on Goodreads Giveaways and when I learned it was the third in this trilogy I immediately went and bought the first two on Thriftbooks. Luckily I did or I might not have fallen as in love with this book. I was able to learn more about the characters and their stories and further grasp the seriousness of this last book. The entire series was almost like one book in itself so I do recommend reading the other two before reading this one. That being said, I loved the entire serie I received this book on Goodreads Giveaways and when I learned it was the third in this trilogy I immediately went and bought the first two on Thriftbooks. Luckily I did or I might not have fallen as in love with this book. I was able to learn more about the characters and their stories and further grasp the seriousness of this last book. The entire series was almost like one book in itself so I do recommend reading the other two before reading this one. "A Brush of Wings" is the 3rd in the "Angels Walking" trilogy. I received a copy through GoodReads' first reads give-away program. I'd never read the other two and wanted to do so before reading this title. I'm glad I took the time to do that. While I think "A Brush of Wings" could have been enjoyed as a stand-alone novel, reading the others made it more enjoyable. It is the story of Mary Catherine, who has a serious health problem, a problem that she wants to conceal from her family and friends "A Brush of Wings" is the 3rd in the "Angels Walking" trilogy. I received a copy through GoodReads' first reads give-away program. I'd never read the other two and wanted to do so before reading this title. I'm glad I took the time to do that. While I think "A Brush of Wings" could have been enjoyed as a stand-alone novel, reading the others made it more enjoyable. It is the story of Mary Catherine, who has a serious health problem, a problem that she wants to conceal from her family and friends. Karen Kingsbury is an award-winning and very popular Christian fiction author. A team of angels plays a prominent part in the story. I would recommend "A Brush of Wings" to other like-minded readers. Just what I needed right now! Encouragement about the spiritual fight going on underneath the veil. Many parts of the plot resonated with me, from believing that God and His angels are working to bring about His will in our lives, and the ending that involved adoption... I have an adopted son, and the feelings that the adoptive mother had in this story about unbelief that she was becoming a mother, and the gratitude for God's grace and plan, were feelings I had when my son was placed in my arms. This was another book club book. There was a point in the middle that I was interested in the outcome, but then the outcome came, and the book kept going...and going...and going. The longer it went, the sappier it got. It was also strange to have angels on a mission that could fail...as if God's plan could not be carried out if their Walking Mission was not a success. SO Predictable!! I literally made a prediction of what would happen after chapter 1 and in detail it all happened... Kingsbury really dragged it along. It could have been shorter but I think the themes were sweet. Tedious. Could have wrapped this series in two books. Wish she had only handled it in one book🙄. I do NOT appreciate the many many "pushes" toward a ketogenic diet in my fictional reading.